After getting quite a few comments about how my gun looks at the weekend I got to thinking about what guns look the best. Have you ever come across a gun that someone else is using that has really caught your attention. Just going on looks not performance. Out of interest, what gun do you have? There lots of nice custom guns on sale but was thinking more of ones you have just come across on a skirmish. Honey badger is a bit like marmite. Me personally not a huge fan but at least it stands out. I'm a big fan of the MP5 SD models and AKs with metal receivers and nicely varnished wooden furniture always look decent. My Stoner M63/MK23 mod 0 seems to catch a lot of people's eye too as I'm always getting asked about it. I also feel a bit like i'm cheating using it but that's a whole other story lol. The Real Sword type 97s really stand out, think i've seen one ever on the field. Still not sure if I like the look of them or not though. Some guy at Worthing EAG ages ago had one of the M4 SMG builds, which looked the balls. Also seen some brilliant Tanaka rifles a camo'd up. Love the 97b when its done up a bit. Stands a fair chance it could be my next toy. Nope it's a custom one I got machined, 4-5" if memory serves, The guys charges about £35 to cut and rethread, then post back. Inner was also machined to size, Tanio Koba barrel which works a treat. Surprising range and accuracy considering it's so short. They do look like cracking guns, if I was to get a Real Sword that would be my choice as their AK lines aren't quite what I am looking for in an AK. I think one of the regulars had one for sale a while back and I was very tempted by it. Ugliest looking gun out there, looks like a scar with a weight problem. Thinking more of nice looking guns, monstrosities are a different thread. This makes the ARX look like a saint in comparison! 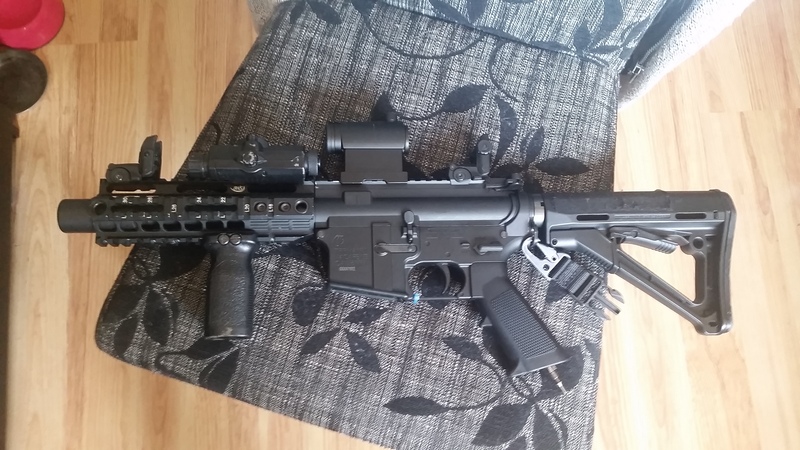 Saying that also, I got myself a tasty looking M4 from poland currently in tamworth with some attachments here for..."tuesday"
suppose - "anything that doesn't have G&G or C M on it"
Noticing a reoccurring trend starting already, people are giving a lot of gun love to their own toys and ones they would like but no one has really mentioned anything that caught there attention at a game. Maybe its because there is too many M4s about and they all blur into one another. I saw a Tm Desert Eagle the other week that was heavily customised and had a tracer unit on the end. Complete beast but looked awesome and great fun to use. Other gun that caught my attention was a Kwa fpg so awesome when it pops open. Would be possible to do all that but not cheap. Would go for a normal gbbr over p* though. One of the few times a gun has stood out for me was when I first laid eyes on a Barrett .50cal someone had brought to a skirmish (cannot remember the brand). Having a deep seated love for sniper rifles I had to go over and have a chat with it's owner. Was a bit dissapointed it was an electric rifle (I prefer spring snipers) but was a nice bit of kit. I saw one once it was absolutely huge. Very impressive looking but apparently the perfomance was not all that. Made you want to run away just looking at it though. Saw a type 98b once, looked amazing with a stubby silencer, had to have a go with that as well! Generally if it's bullpup and not sa80 family then it's interesting to me, some of the slightly more exotic lmg's too. I think at least one person has shown interest in my f2000 every time it's gone out, it looks so odd you can't help but notice it.